In most regions of the world, the largest market for maleic anhydride is unsaturated polyester resins, which account for more than 60% of the total production of maleic anhydride. Demand for unsaturated polyester resins is influenced by the health of the construction industry and overall state of the economy. Other significant markets for maleic anhydride include lubricating oil additives, production of organic acids (fumaric, malic, and succinic), and copolymers. In recent years, demand for maleic anhydride has been growing at modest rates in North America and Europe, but more vigorously in the Middle East and Southeast Asia. In China, growth has slowed after years of strong increases. Unsaturated polyester resin production will continue to have the largest market share and will drive refined maleic anhydride consumption on a global scale. The developing regions will experience the highest growth in maleic anhydride for unsaturated polyester resin production because a considerable amount of unsaturated polyester resin goes into infrastructure. Overall economic health will affect the unsaturated polyester resin market because it is tied to the construction, automotive, and marine industries. 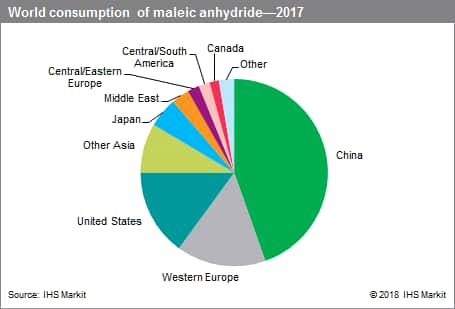 Global producers of maleic anhydride are numerous, and even the largest producer, Huntsman, accounts for only a little more than 7% of the world market. However, the company has the largest share of the combined US and Western European market, with about 35% of the total. There are many producers in China, most with relatively small capacities. Nevertheless, China is the largest global producer of maleic anhydride, and production is becoming more concentrated in the hands of a small number of large-scale producers. Maleic anhydride can be produced from either n-butane or benzene. The butane process is the newer route, and is more economical in most parts of the world, as well as more environmentally friendly. In the United States, the benzene process has been phased out since the 1990s. In Europe, benzene-based processes account for less than 15% of total capacity, and some facilities operate only sporadically. Historically, benzene derived from coal has been a cost-effective source of feedstock in China, but this situation is changing because of greater supplies of butane on the global market. The benzene process used to dominate with over 85% of the total capacity before 2013, but the butane process has been preferred for most new installations during 2013–18 and now accounts for over 40% of the total. In most regions, consumption closely parallels production. Exports are usually much less than 20% of production. Generally, trade in maleic anhydride remains regional because of high transportation costs, especially given the need to heat liquid product in transit. Molten maleic anhydride is generally shipped by land transportation only, while exporters have to install the solidifying facility with extra cost for briquette, pastille, flake, or powder form in oceangoing container shipments.